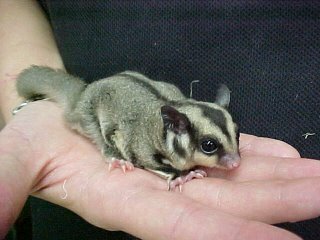 Niki and I are watching a sugar glider for 3 weeks!! A few hours ago I didn't know what they were, but we have one!! In our house!! And it climbs on us and jumps!! And it's way cute and eats almonds and apples!! Our friend AF is going to Africa tomorrow for 3 weeks to volunteer at an orphanage. She was over for dinner tonight and talked about her little pet. After 15 minutes of figuring out what it is, Niki volunteered to babysit while she's gone. And voila! We have it. Can't wait to play with it! Should be a fun few weeks....if you wanna come see it, let me know! It's friendly. And loves to be held close. And likes to crawl on your shirt. And jump from things. And sleep in a sock. Yay! I'll take picture of Izzy soon.